Welcome to the second read-along of the month, The Islands of Chaldea! I hope that a few of you got a chance to read it (Jenny?!). There were so many cool ideas in this book that, yes, it did make me sad yet again that this was the last DWJ book. I was trying to think about DWJ heroines as I read about Aileen, wondering how she stacked up, who she was similar to and who she differed from. (Does that make sense? I've had a lot of cold medicine today.) I thought about Polly and Mig and Nan Pilgrim, girls who felt helpless at various times but all found their strength eventually. I also thought about Gwendolyn (and Mevenne in this book) and Laurel and the others who knew they had power and who abused it dreadfully. I also pondered how Diana excelled at writing about differences between worlds and cultures. 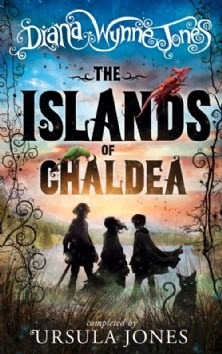 Whether in Deep Secret or any of the parallel worlds of the Chrestomanci stories or the different islands in this book, she really makes the reader feel as if they are traveling along with the characters. Subtle differences can be much more revealing than huge ones, right? 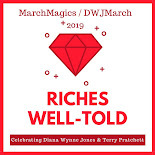 I also think I noticed this time through where the author changed and I know which things DWJ would never have written into the ending but I also decided that I don't ultimately care. This is a lovely story no matter what. What was your experience with this book? What did you think about? What did you love? Was there anything you didn't love? Let's chat in the comments and be sure and leave links if you wrote your own post about this book! Lauren and I had a great discussion on Twitter last week about Aunt Maria. If you want to talk about Chaldea this Saturday, join me around 2pm Pacific/5pm Eastern/9pm GMT and use the hashtag #dwjmarch. Hopefully I'll be less sick and more coherent then! It really is fun to chat in real time. I hope you are able to join me! I did think as I read through this that it would make a fantastic series. I wonder if that was DWJ's plan all along. Thanks for the link to your interview! And yes, it would be a fun series, even if it was just tangentially about Aileen in the future books (kind of like how Howl and Sophie pop up in the other books in that world). I thought the same thing about Earwig and the Witch too. Oh Kristen I can't. I can't. I wanted to but I can't. There can't be no more new Diana Wynne Jones books for me to read. That has never been the situation before, and I don't want it to be the situation now. It's okay. I totally get it. I'm down to Hexwood and the Dalemark books and am dragging them out like anything. I will be a bit sadder after I've read The Spellcoats later this week. Me too. I have no new DWJ books left. None. It is a sad thing. I'm in the middle of Chaldea and enjoying it tremendously all over again. But I totally understand Jenny's reaction. When I think of there being no more to come, I want to weep. It's depressing. There's really no other writer like her (yet). I'm hung up in the first third. I really, really want to like it, but I haven't been grabbed by any of the characters and nothing has really happened yet. I did find it a bit slow at the start this time through, really picking up after they start the sea voyage. It seems I'm a bit late to the discussion, sorry, but if anyone's still there my review from last year is at https://calmgrove.wordpress.com/2014/03/26/chaldea/ where I guess at where Ursula took over. Now I need to go check if I was right!